Anyone who has studied anatomy and physiology at all would agree that the human body is amazing. It is a machine that keeps us moving and creating, and recreates itself to keep itself healthy. It has defense mechanisms and the ability to reproduce, all while nourishing itself by using our environment. We could survive equally by breathing the air in the mountains and in the city (although many feel better in one or the other), and nutrition can be gained and processed by eating nearly anything. But there are some things beyond basic anatomy and physiology that will also blow your mind. This infographic goes into everything from rejuvenation to strength. For instance, a femur is about four times stronger than concrete! If you know anyone who broke their femur, ask how, and you will learn how to break up concrete. But how are each of these facts useful? Why do our bones have to be so strong? Why do our stomach contents have to be so acidic? 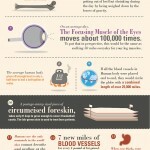 Knowing these things is very fun, but knowing why is more fascinating.